Download PDF Really, nothing says Southern sophistication and comfort quite like this Southern Brunch Classic! 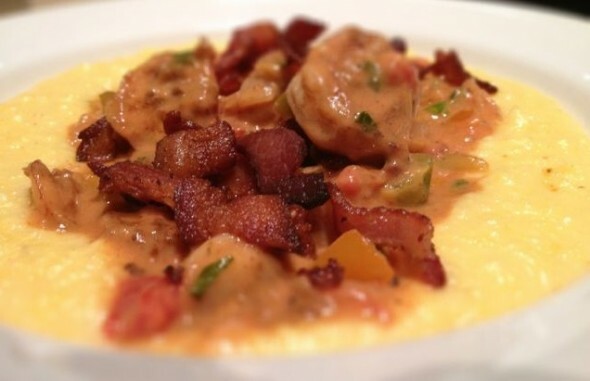 Serve over a creamy bowl of Cheesy Grits to perfectly balance the spicy shrimp. Invite friends over and greet them with spicy Bloody Marys and some great jazz. Once the mood is sufficiently mellow, serve up these spicy, smoky, creamy bowls of comfort along with some strong coffee and maybe a sweet bread – sticky buns or beignets, anyone? Toss the shrimp with the olive oil and powdered chipotle. Season with salt and pepper and set aside. If you’re making this for brunch, you can do this step the night before and put the shrimp in the refrigerator~no sense having shrimpy hands first thing in the morning! 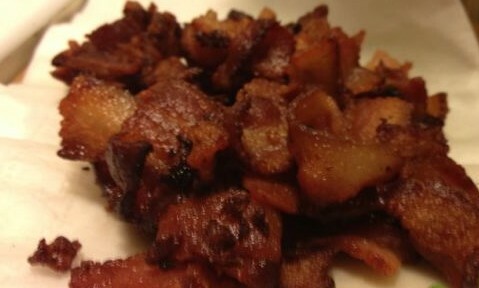 In a heavy pan, cook the bacon over a medium flame until it is crispy. Remove from the heat. Using a slotted spoon, remove the bacon to a paper towel to drain. Turn the heat back on to medium and add the onion and pepper. cook until almost translucent, about 4-5 minutes. Add the shrimp and cook just until done, about 2-4 minutes. 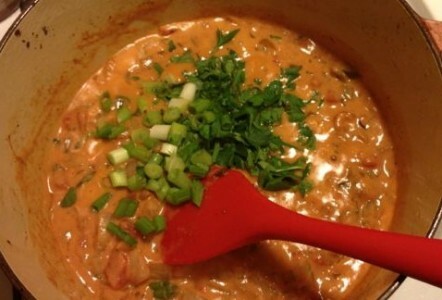 Remove the shrimp, leaving the bacon-y onion and pepper mixture. Stir the flour into the onions and peppers. Cook for 1 minute. Stir in the chicken broth. Add the tomatoes and cook for 2-3 minutes. Stir in the cream. Bring the mixture back to a simmer and allow to thicken slightly. Stir in the scallion and parsley, and season with salt and freshly ground pepper. Add the shrimp back in and allow them to heat through, just about a minute or two. You can also up the heat quotient to suit your taste with a little more powdered chipotle pepper [I just love its smoky flavor] or your favorite hot sauce. Ladle over Cheesy Grits and sprinkle with the reserved bacon. Serve along with a Bloody Mary and strong coffee to good friends!